Orion Hall Residence Director Tori Penney (left) and resident assistant Lydia Thorner (right) stock shelves at the Midcoast Campus Captain’s Cupboard. SMCC’s Midcoast Campus has teamed up with a Brunswick-based organization devoted to fighting food insecurity to help SMCC students in need. 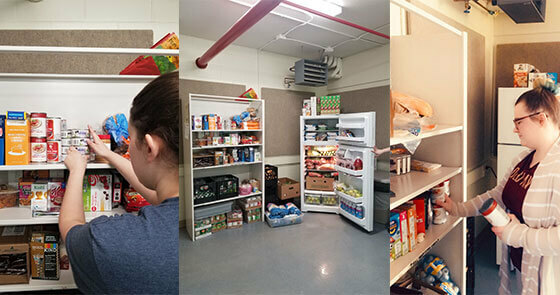 The Mid Coast Hunger Prevention Program (MHPP) is now providing about 500 pounds of food a week to the Midcoast Campus’ Captain’s Cupboard food pantry, which is located in Orion Residence Hall and open to all students. Tori Penney, the Residence Director of Orion Hall, picks up cereal, fresh and canned vegetables, fruit, snacks, herbs, milk, eggs, bread, meats and other foods each week from the MCHPP offices in Brunswick. She brings the food back to Captain’s Cupboard, where some 30 to 40 students a week pick up food. The Captain’s Cupboard provides some relief for students who are juggling school, jobs, tuition, rent, transportation issues, child care and family responsibilities. Studies show that hunger can have a negative impact on students’ abilities to succeed, and providing some help goes a long way for many students. SMCC’s South Portland Campus has its own Captain’s Cupboard, which opened in 2013 in the Captain’s House. The Maine Community College System (MCCS), which oversees SMCC and the state’s six other community colleges, is also addressing food insecurity among students. The MCCS is rolling out a public awareness campaign called Brains Need Food at all seven colleges. The campaign will make information more readily available about on-campus and community food resources that are available to meet their basic needs. Shown in Venice are Trevor Gough, Emma Rose DiMuzio, Molly Weathers, Fine Arts Professor Virginia Rose, Elizabeth O’Shea, Allina Podgurski, Sadie Hansbury and Margaret Goodson. Seven SMCC students got the ultimate hands-on learning experience over spring break with an overseas trip where they learned about the art, architecture, history and culture of Italy in person. 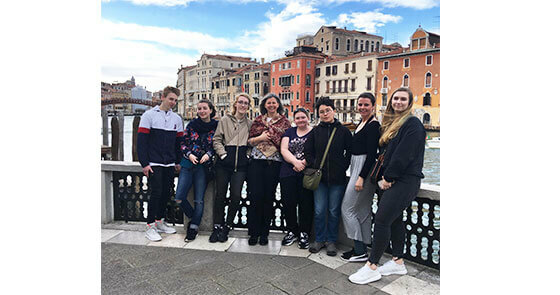 Students in Virginia Rose’s Italian Renaissance Art & Architecture class (ARTH 192) spent the week of March 9-15 in the Italian cities of Ferrara, Florence, Venice and Padua learning about the art and artists associated with northern Italy from the 14th to the 17th centuries. In visiting the region in person, they were able to experience the important works in their original settings and cultural context. A sampling of the sites visited include the Peggy Guggenheim Museum in Venice, the Uffizi Museum in Florence, the Castello Estence medieval castle in Ferrara, and the Scrovegni Chapel in Padua. The Italian Renaissance course is among the study-abroad opportunities offered in recent years through the SMCC Global Classroom program. 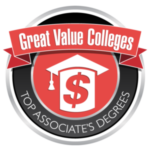 Global Classroom courses are semester-long hybrid classes that include online coursework and study abroad travel. To learn more about SMCC’s international offerings, students can visit the Global Studies webpage. Matt Richards, Associate Dean of Students and Director of Athletics, in front of the interactive Athletics Hall of Fame inside the HUB lobby. 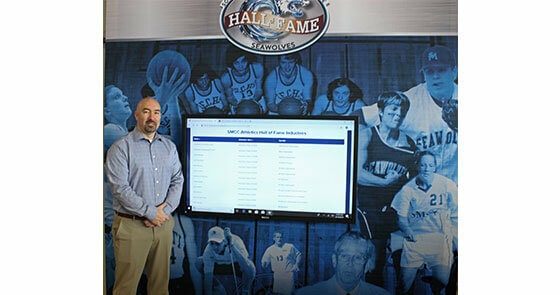 The SMCC Athletics Hall of Fame has long had a home on the SMCC Athletics website. Now it also has a physical home in the lobby of the HUB Athletics Center. The Hall of Fame features an 8 1/2–by-9-foot canvas backdrop with photos of student-athletes through the decades to give a historical perspective of the College’s long athletics history. In the middle is a large interactive touch screen so people can learn more about the Hall of Fame and its inductees. The Athletics Department formed the Hall of Fame in 2006 to honor former student-athletes, coaches, administrators and supporters of the Athletics Department for their outstanding performances and contributions to the rich tradition of the college’s athletic history. There are now 33 members in the Hall of Fame. 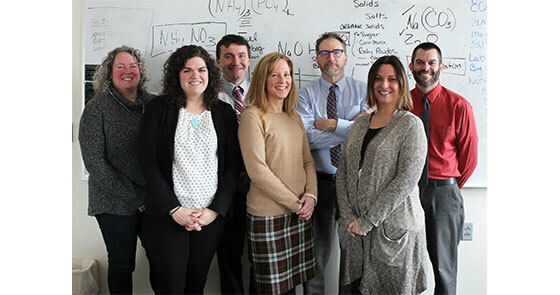 Members of the ATD Early Connections team are (from left) Meridith Comeau, Stacey Kardash, Jason Saucier, Kathleen Doan, Jim Whitten, Amy Lee and Patrick Haviland. SMCC launched its one-to-one Start Smart orientation sessions last fall at the recommendation of the Achieving the Dream (ATD) Early Connections work team. Early results show that students who went through one-to-one orientations were more likely to complete the Fall Semester in good standing and to register for the Spring Semester than students who went through group orientation sessions. That is just one concrete result the College is seeing through its Achieving the Dream efforts. The Early Connections work team is one of five ATD work teams at SMCC. 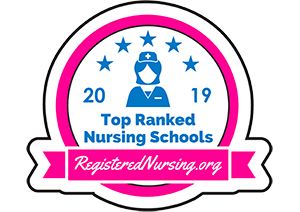 It has two primary goals: increase the number of applicants gaining acceptance to SMCC, and boost the number of accepted students who receive early advising. The Early Connections team last year recommended that the Advising Office offer one-to-one “Start Smart” orientation sessions to incoming students. Traditional orientation sessions might include 30 students or more. For the Fall Semester, 341 students went through the Start Smart orientations, and 1,124 took part in group orientations. Seventy-five percent of the Start Smart students ended the semester in good academic standing, compared to 67 percent of the group orientation students. Eighty-three percent of the Start Smart students registered for Spring Semester, compared to 73 percent of the group orientation students. Furthermore, a survey of students in the Start Smart orientations showed that 90 percent of them gave the one-to-one orientations a “5” (80 percent) or a “4” (10 percent) on a scale of 1-5. 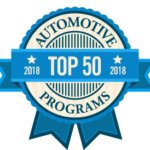 The Kresge Foundation in 2017 awarded an $810,000 grant to The Foundation for Maine’s Community Colleges, allowing SMCC and other Maine community colleges to join Achieving the Dream, a network of more than 220 community colleges nationwide dedicated to improving student success. As part of the ATD framework, SMCC is using data-based approaches to improve student outcomes. For more information about SMCC’s ATD initiatives, please visit the SMCC ATD webpage.